This is the very pink corner in my bedroom hallway. 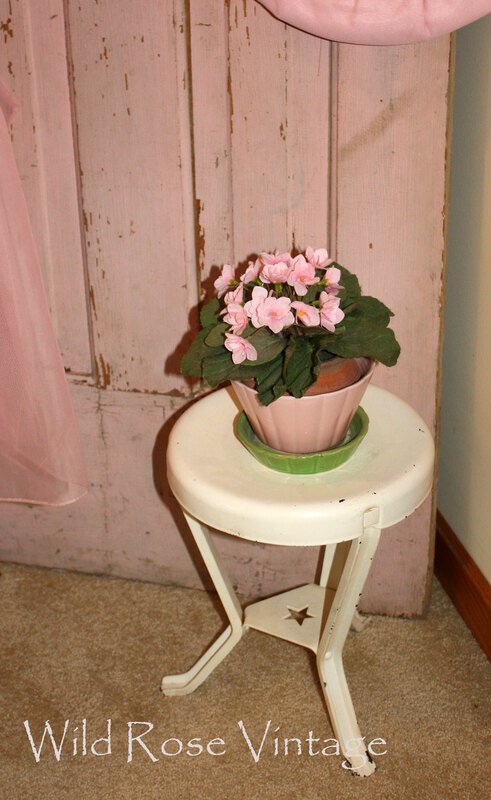 I just picked up the pink door in Missouri recently not really knowing exactly where I was going to put it when I got home but I knew I couldn't walk away from it at $18. Mr. Wild managed to squeeze it into the camper for me. 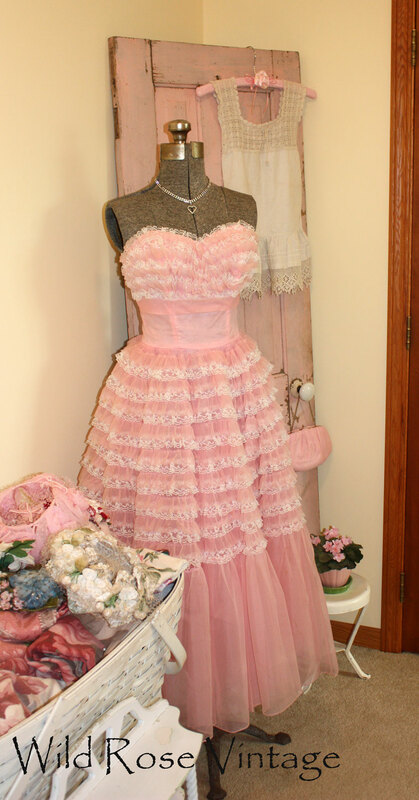 As we were driving around MO it dawned on me that it would go well with my 'new' old dress form that I picked up a few weeks ago so that I could display the prom dress I bought at a yard sale last spring for $5. It's just all fell together without any effort. It's very pink but I love it. 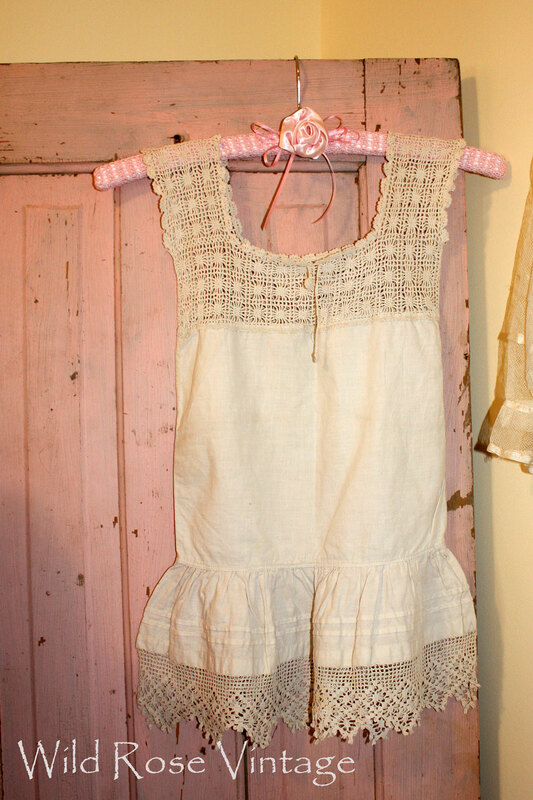 I added the pink chiffon purse I found at another yard sale last summer, it still had the party invitation for the your girl who owned it at one time. Not sure if this is a camisole or what but I love all the hand crochet that is on it and I hung it on a hand crochet hanger I made along with a fabric rose I made last summer. I also found this old milk stool while we were away. A couple of years ago I saw a woman carrying one around at a flea market like this only it wasn't white. I vowed I'd find one some day and there it was in a shop just waiting for me, with white paint...all the better. The rest of my Missouri and Iowa finds can be found here from an earlier post this week. 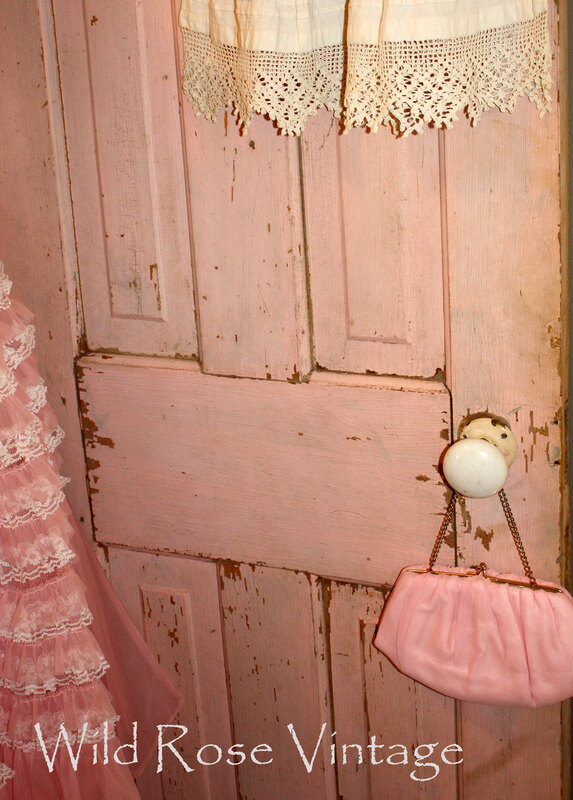 I LOVE LOVE LOVE your pink door and it looks amazing with your pink prom dress and sweet purse. What fabulous finds! Both the door and the dress! They look wonderful together! Wonderful finds! The pink door looks really great with your vintage prom dress, which I love, love very much! Love the little milking stool too. Wow that is a beautiful setting and everything works together so well. Lucky you for finding such treasures. Isn't it so much fun when treasured finds come together like that! 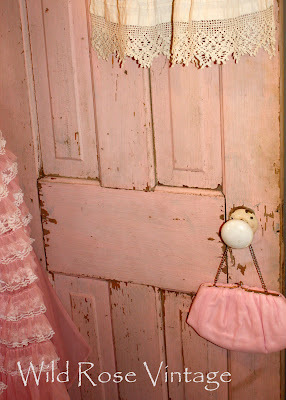 Great pink door! Hey lady, I want to come shopping with you! Love your finds. Thx for sharing. What a gorgeous pink dress!! and LOVE that pink door! I love vintage prom dresses and have several. 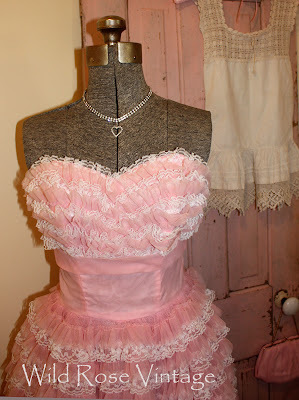 I posted a beautiful pink organdy dress last week for Pink Saturday. I am sharing a pink tulle "ballet tutu" this Saturday. So glad to have found your blog. Will visit often. Hope you will visit me and will decide to follow. Just couldn't get any better! Both the door and the dress are beauties. Just lovely. That door is a real find. Just dropping by from Pink Saturday to visit. That pink door is gorgeous. so glad your hubby was able to squeeze it in to the camper for you! So perfect, Faye! You have such an eye for pulling together a display! I'm tickled pink over this corner Faye!! Wow! Two amazing pink finds for amazing prices! That pink door is a wonderful back drop! Happy Easter! Love your pink door, and prom dress! Great finds! Noticed your baby basinett too! What do you have in there? I have one, and maybe I will put my dolls in it. 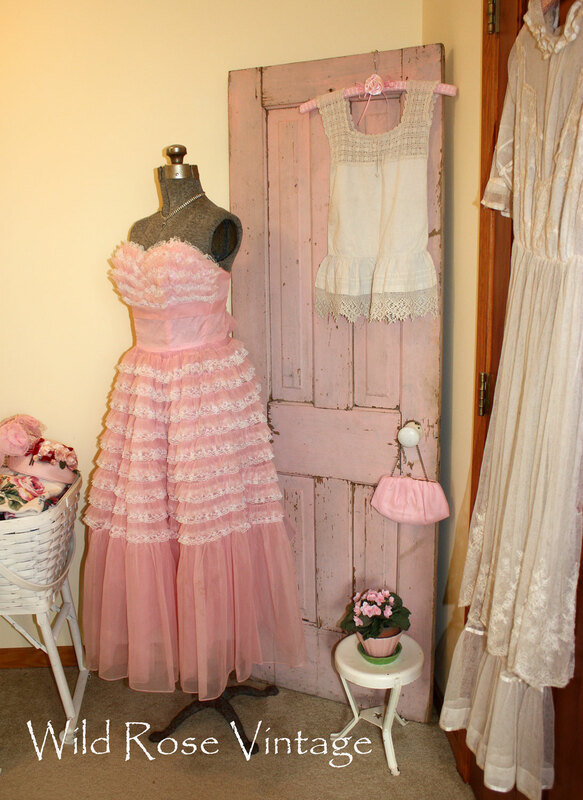 What a charming display, Faye...the pink door is a real find! Love all of your goodies...the purse with the invitation is so sweet! Fantastic pink door - just perfect with all of its chippy goodness! Five dollars for a lacy prom dress - score!!!! I never see prom dresses for less than $50 here in CT. Everything looks so lovely and you must put on a big old smile everytime you pass this sweet corner. The dress and the door make perfect companions. Wonderful. $18.00!! WOW! I remember when you found the prom dress, I was jealous then and I'm still Jealous! It's funny how things just seems fit! I don't know what I like better - the dress or the door. I want them both. Isn't she lovely??? Wow...both the dress and the door!!! Now you know a pink door like that is almost something you never find...so you got a WONDERFUL item! I'm so excited that you shared it with us for Pearls and Lace Thursday!!! I'll bet that corner makes you smile every time you walk by. How fun! loved seeing your vintage bling in the header--one of my favorite things! I'm hearing the soundtrack of Grease! So cool! Thank you for joining me at Home Sweet Home! Sometimes when I see things like that gorgeous prom dress and stool (but especially the prom dress) I wish wish wish I lived in an area where there are lots of fun old shops/garage sales/yard sales! Not done too much in my neck of the woods. You lucky lucky lady! Five dollars for a lacy Prom dress - score!!! !